2015 Ford Explorer excels in technology and even offers more luxury than you find in luxury vehicles. It is a complete affordable family vehicle. This is a new luxury sports car reaching heights with respect to its shape, performance, elegance and is also environmentally friendly. The new vehicle interiors are well trimmed and come with standard six- speaker stereo and an input jack. It is equipped with features in the interiors such as satellite radio, rear parking sensors, rearview camera, automatic dual zone climate control, push-button start, proximity key, navigation, adaptive cruise control, blind sport monitoring, lane departure warning, park assist parallel, lane keeping and voice-activated infotainment system in association with a 8-inch touch screen and a sunroof. The interior features ensure an enjoyable and comfortable trip. The cabin is attractive with premium soft touch materials and quality switchgear. This car has cargo space of 21 cubic feet. The safety features include all the air bags, child safety locks and traction control. The exterior design appears fine and has a fancy look. It has a wide body and large wheels featuring charming arches. This offers special SUV attraction. It has intelligent 4WD to monitor continuously the steering angle, throttle position and the wheel speed to determine the condition of the wheel and the driver’s intent. The front and rear torque is determined by the system and it helps in reducing the wheel-slip, virtually it can go on any terrain. It is fitted with power door mirrors. The headlights are halogen with projector beam lenses. The exterior colors include Dark side metallic, Caribou metallic, Bronze Fire metallic, Magnetic metallic, Ingot Silver metallic, Tuxedo Black, Ruby Red, and more. This new vehicle offers 290 hp in its V6, 3.5 liter engine with a six-speed automatic transmission. On the front wheel drive models, 240hp is available on 2.0 liter turbocharged four cylinder engine, while the sport features 365hp with a V6, turbocharged 3.5 Liter engine. The EPA reports 17 mpg in the city and 24 on the highways as mileage available for the base 2015 model. The new vehicle price is from $ 30,600 – $ 42,670. The official date is not announced, but it may be expected before the mid year of 2015. 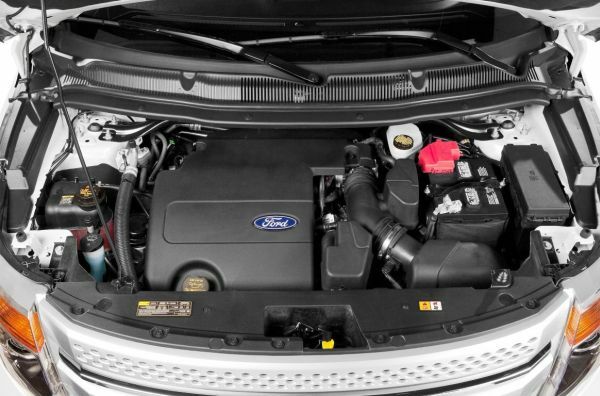 2015 Ford Explorer has complicated features, but is equipped with technology ensuring a solid ride. The high-tech features make it more special and valuable. Get a SUV and a luxury sport car features in one car.